A professional team of massage therapists providing on-site chair massage support to individuals, groups, businesses and associations at events in and around Austin, Texas since 1995. Our mission is to positively enhance the energy, vitality, health, morale, performance, productivity and experience of people at work or play. We offer both on-site services and locations to serve you. 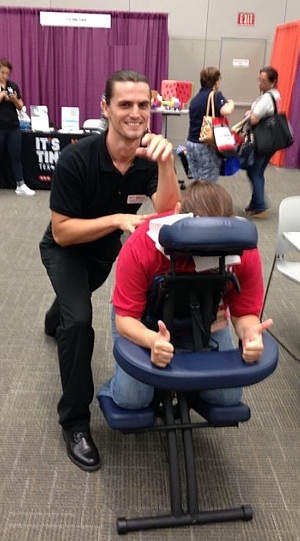 Contact us to schedule on-site chair massages for your staff appreciation day, employee wellness program, trade show, convention or other special events! We deliver a very thorough acupressure-style seated massage technique designed to affect a person’s overall health and well-being, reduce stress, and leave one feeling relaxed, yet alert and revitalized. Participants receive massage to their shoulders, back, arms, hands, neck, and scalp while remaining fully clothed (no oil or lotion used) and sitting on a massage chair specifically designed with comfort in mind – Perfect for any occasion! Tom Darilek, Seize the Day Owner, was trained in the principles and techniques of Chair Massage in 1990 by Iris Lee of the Touchpro Institute of San Francisco, California, founded by David Palmer, the “father” of Contemporary Chair Massage. 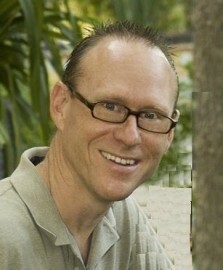 In 1995 Tom founded Seize the Day On-site Chair Massage Service and began organizing chair massage events for businesses and organizations in Austin; pulling from the pool of therapists who had also been “trained” in chair massage. Much to his disappointment, Tom began to realize that the level of expertise among therapists varied greatly. So in an effort to ensure greater Quality and Consistency, Tom began recruiting and training therapists himself, building his chair massage team one therapist at a time. The result is a team of therapists that many of our satisfied customers have come to rely on. Since 1995, Seize the Day massage therapists have provided chair massage support to 100’s of businesses and organizations in central Texas. We continually strive to be the industry leader in chair massage; committed not only to high levels of quality and consistency of service, but also greater accessibility and user-friendliness. Our receptionist is always standing by, ready to take on-site chair massage orders, which can also be initiated on-line 24/7. We continually recruit and train more therapists to make sure we are always ready for any job no matter how large or small and to provide non-interrupted support for all our recurring clients. And most recently we’ve made is possible for On-site customers to make appointments on-line.